The Conversation-Model view the process model "who with whom and what". All process participants can be included in a compact form of modeling as long as denoting which communication is involved. ConceptDraw has 142 vector stencils in the 8 libraries that helps you to start using software for designing own Business Process Diagrams. Use Conversations library with 11 objects from BPMN. Process participants are represented as Pools in Conversation-Models. The Communication-Shape defines a set of logically related message exchanges which are tied to Pools via Conversation-Links. If there is a multi-instanced Pool (also introduced with BPMN 2.0) involved, a Forked Conversation-Link is used for it. 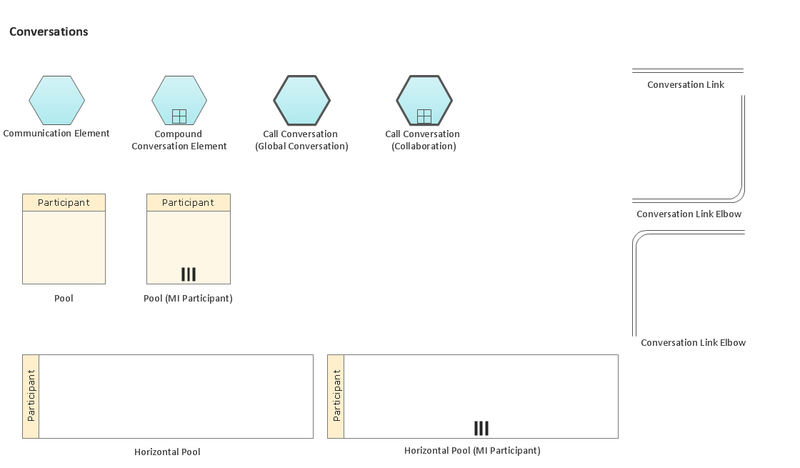 Conversations library from Business Process Diagram solution provides 11 vector stencils for conversation objects (hexagons), links and participants. Use the Conversations library to draw the BPMN 2.0 Conversation model diagram that shows the conversations between the participants of business process as a high level overview without the individual message flow and process logic.